You may have heard of scam phone calls and check fraud targeting unsuspecting victims. Many of our community members have been scammed by callers presenting themselves as IRS or USCIS or Police. 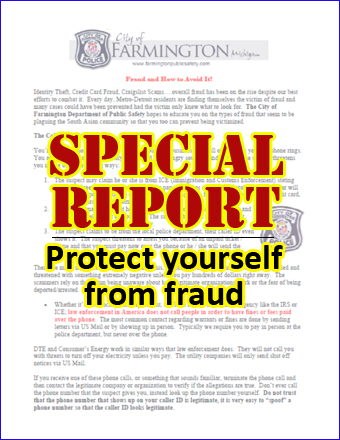 In response to numerous complaints filed by Michigan Indian community members, The City of Farmington Department of Public Safety has e-mailed a very helpful document to Miindia.com for publication. The document lists a number of scams and provides guidance. We sincerely hope that this message reaches every community member so that nobody loses his/her hard earned money. If you get a threatening phone call the best bet is to hang up. Never accept a check from a stranger wanting to buy something from you.